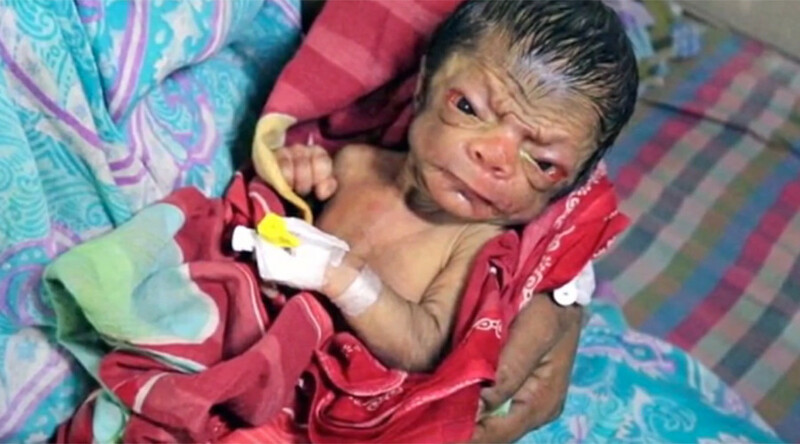 A newborn baby boy has been dubbed Bangladesh’s real life Benjamin Button due to his resemblance to an elderly man resulting from a rare genetic disorder which affects one in 8 million births. The newborn has a wrinkled forehead, sunken eyes and a shrunken body, sparking comparisons to the Hollywood film and F Scott Fitzgerald story, The Curious Case of Benjamin Button, which depicts a baby born looking like an old man who then ages in reverse. The boy was born in the village of Bhulbaria in Bangladesh's Magura district on Sunday afternoon according to India Today and has been the source of much curiosity, with neighbors flocking to see the child. His parents told local media they are delighted and are not distressed by the child’s condition, known as ‘progeria’. "I am not unhappy, nor do I feel any sorrow that my son is different," the boy’s father Biswajit said. “Our first child, Aparna, has taken after her mother. But my boy looks like me, and I am happy." People with progeria, also called Hutchinson-Gilford Progeria syndrome, age eight times faster than normal and have a very low life expectancy - with few living past the age of 13. In May, India Today reported the death of a 15-year-old boy who had become the face of an awareness campaign about the condition.